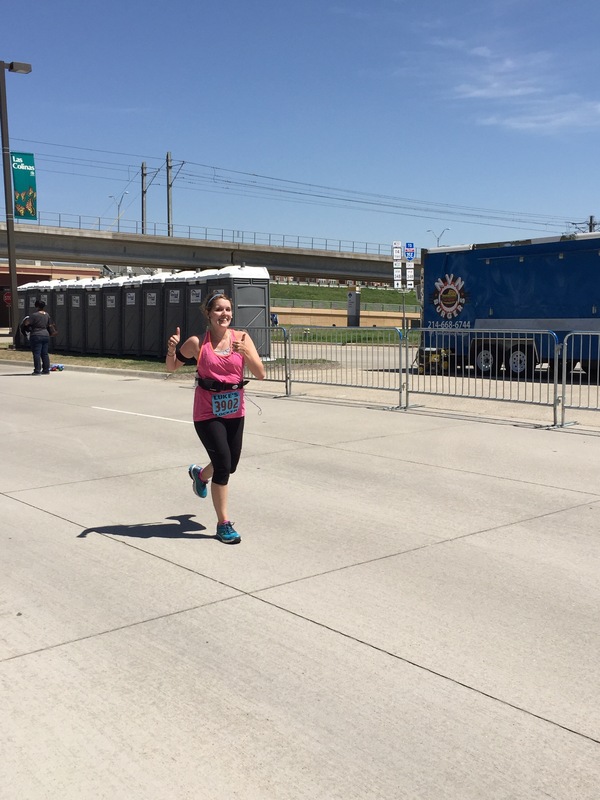 This past weekend, my first marathon took place in Irving, Texas! It was a life-changing, exhilarating experience that I will cherish for years and years and years. After giving myself a few days to recover and enjoy the Easter holiday with my family, I want to share a recap of the weekend with y’all. On Good Friday, Chris and I drove to Irving and checked into our hotel room. 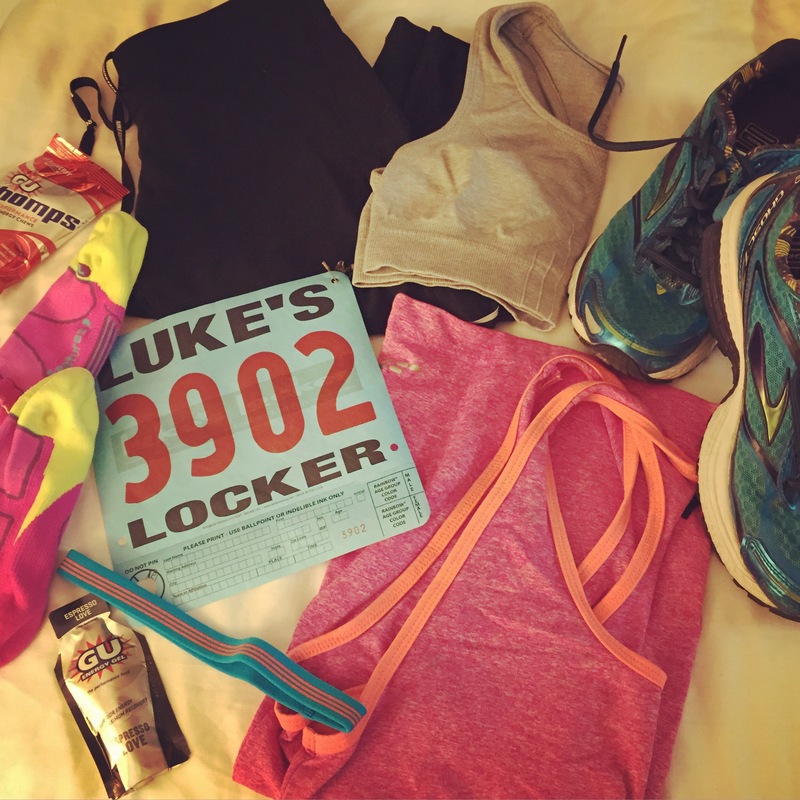 I was fortunate to be able to get off work a few hours early, so we could make it in time to pick up my packet and bib at Luke’s Locker. 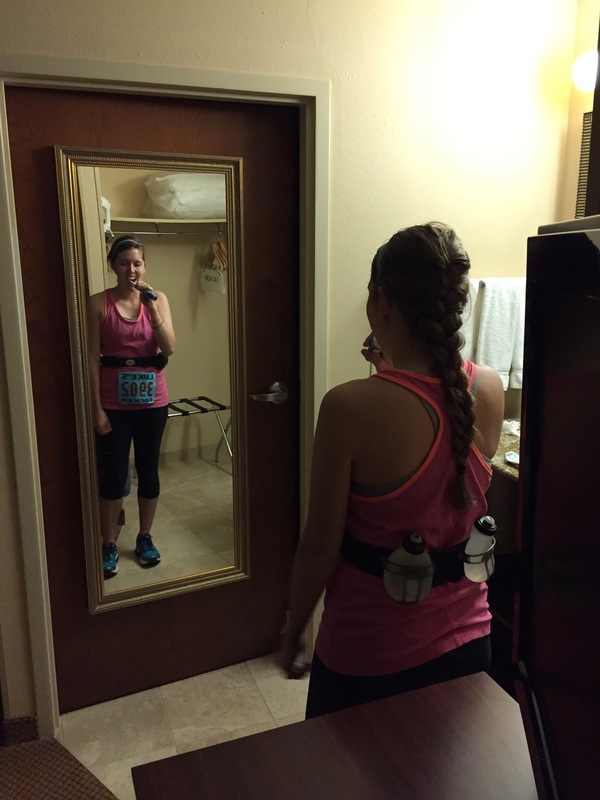 While this made me feel a little more relaxed, knowing that we could take our time to check into the hotel and that I would not have to pick up my packet the morning of the race, I still was feeling pretty nervous. Thankfully, Chris is very good at helping me remain calm. Anyway, we found an Italian restaurant and grabbed dinner. They had the best bread, which helped in my carbo-loading efforts. Then, we stopped at the grocery store to pick up a few food items and some Advil, headed back to the hotel and got ready for bed. To give my breakfast plenty of time to digest and to have enough time to use the restroom, take my time getting ready, etc. I planned to get up at about 5 a.m. However, I set my alarm for the wrong day and ended up waking up an hour late – around 6:15! I stayed calm, tried to get ready quickly without stressing (Chris decided to snap a quick picture to document the morning), and we walked out to the starting line, which was about a 10 minute walk from the hotel, around 6:45. 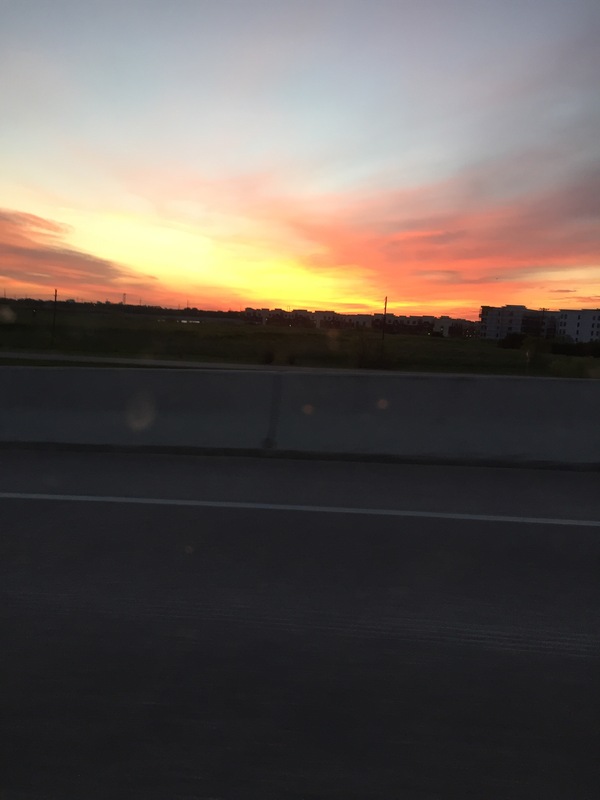 The race was scheduled to start at 7:30, so we had plenty of time, which was nice, and we even got to see the beautiful sunrise. I think oversleeping actually ended up being a good thing because I didn’t have time to psych myself out. Soon enough, it was time to find my corral and say goodbye to Chris… Can you tell I’m not a morning person? The gun went off and the race began! The strategy I mapped out for myself was to run 5 minute intervals with 1 minute of walking for the first half, and increase the intervals in the second half if I felt good. During the first half, I felt like I was making good time, not wearing myself out too much, and taking it relatively easy. It seemed to fly by and the volunteers were all so nice. There were water stations every mile or so throughout the course for the first half, so it was easy to wash my fuel down with water regularly. This part of the course also had the half marathon runners, so there were lots of people and it was great to feed off of that energy. Then came the second 13.1 miles. The way the course was laid out, the marathon course had an out and back leg that split off from the half marathon course. This was nice, as part of it ran through parks and trails, but then it got to the point where it was in a hilly neighborhood. I was doing pretty well until about mile 17 or 18. All of a sudden, I felt so drained, and everything hurt, including my hip, which never bothers me. My knee was actually feeling fine, which was a blessing. I stopped doing as many intervals and just ran as much as I could and walked. It was a small race (under 400 for the marathon), and because I was at the back of the pack, there were less and less people out there around me. The water stations were also further apart, which made it difficult to stay motivated. This was tough when I was already hitting a wall, feeling overwhelmed with 8 more miles to go on a hillier course than I anticipated and few people around, most of whom were also walking (but then again, running a marathon is supposed to be tough). I’ll have more on this later, but I honestly didn’t know if I could finish at this point and resolved to take it one mile at a time and see if I could focus on my music to make it to mile 19, then 20, and then 21. I eventually made it to mile 22, when I finally felt like I could do it, even though I was totally beat. At that point, I made a new friend and we ran and walked together for the rest of the race, talking and trying to encourage each other. I will also have more on this, later. Finally, the convention center where we started was in sight off in the distance. We took one final walk break and pushed ourselves to run the rest of the way to the finish line. The finish line was such a blur. There were some people who stayed for a long time, and who I’m very grateful for. They cheered as I was coming in, though I was also listening to music and trying to savor the moment. I finally saw my husband and gave him the thumbs up – I was almost there. I sprinted to the finish and then it was all over. A volunteer insisted on putting my medal on me and I found Chris and gave him a huge hug. I shed a few happy tears. I found my friend, who didn’t have anyone to meet her at the finish, and congratulated her and thanked her for running with me. And then we left to go eat. Chris took this photo right after I was handed my medal! It was certainly one of the most accomplished feeling moments of my life. 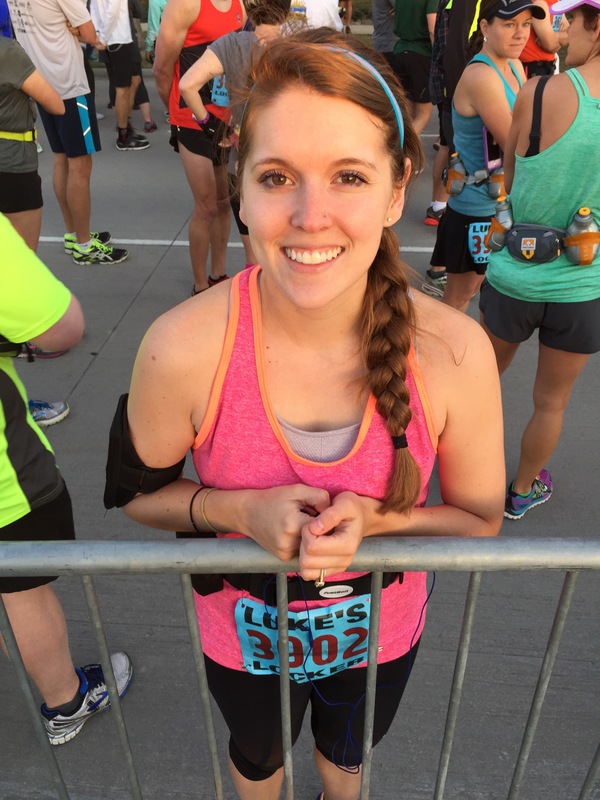 I felt like I gave the race everything I had and was absolutely giddy with joy and excitement. I even shed a few more tears of joy on the way home. Thanks to everyone who has been supportive of me since I embarked on this endeavor. What’s made this experience so exhilarating is having people by my side to share in my joy. I’m so grateful to have made it to the finish line and still can hardly believe it’s real… but it is! 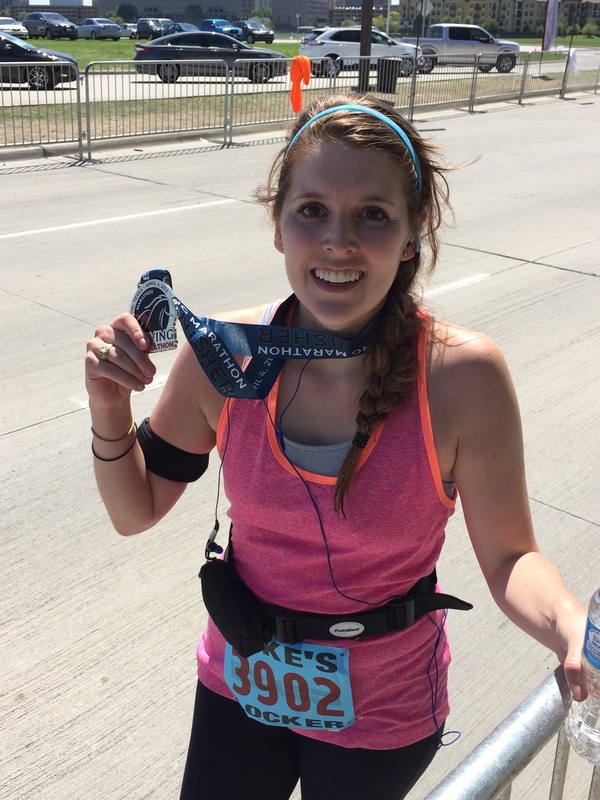 I’m a marathoner!